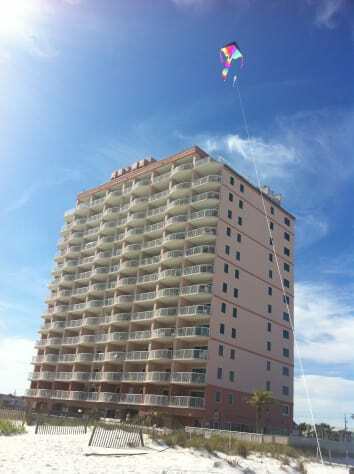 UNIT 1207 ROYAL PALMS BEST REVIEWS BEST PRICE GULF FRONT - U WILL LOVE IT!! NOTE: OUR CALENDAR IS ALWAYS UP TO DATE! A true Paradise on this land and is professionally managed!! 12th floor views are jaw dropping! Brand New tiles installed! This unit can comfortably sleep 6 - (4 adults and 2 kids). 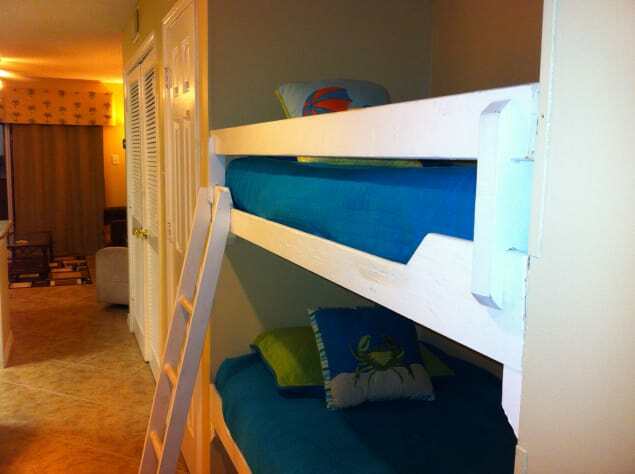 There is a queen bed in the master suite, sleeper sofa in the living room and bunk beds in the hall-way. Your kids are going to love the bunk-beds. 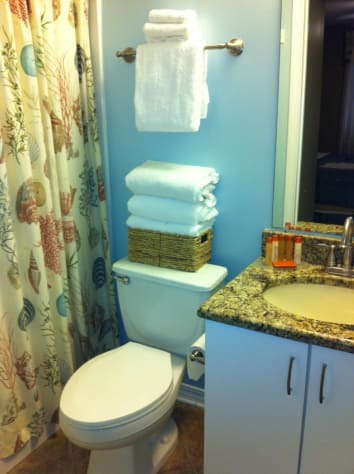 The best thing about this condo is that it has two FULL baths! The master bed has its own bath with other full bath in the Hallway. 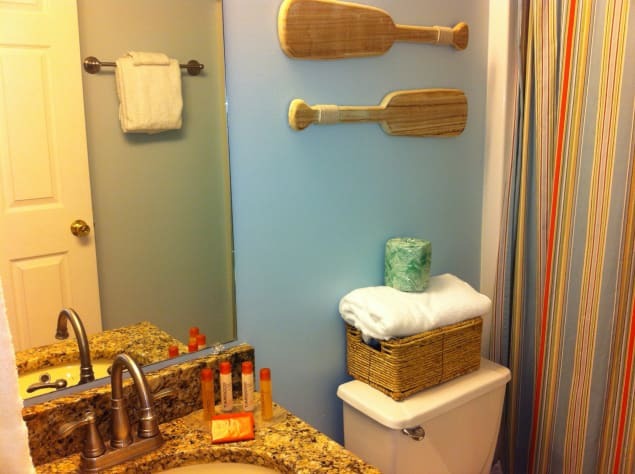 The property has amenities that are maintained extremely well. There are two pools (indoor and outdoor), security, covered parking, sauna and steam room, hot tub, media room and boardwalk to the beach with its own showers. 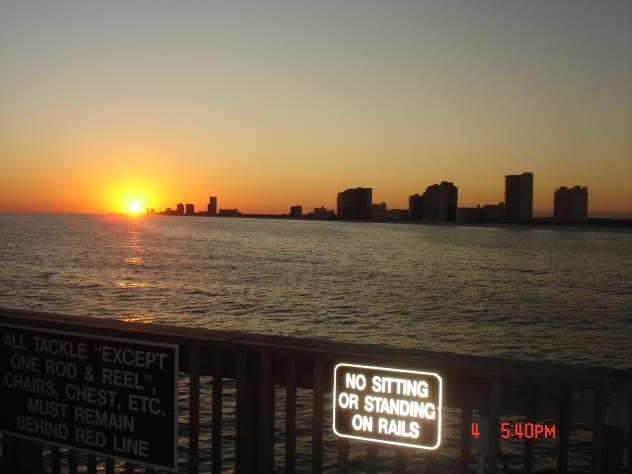 The balcony is extra large and curved giving you mind blowing views on the eastern side - there are no buildings on the east - just the brand new Fishing Pier and the Gulf State Park. Our western sided condo unit gives you a soul refreshing sunset view. You will never want to leave!! 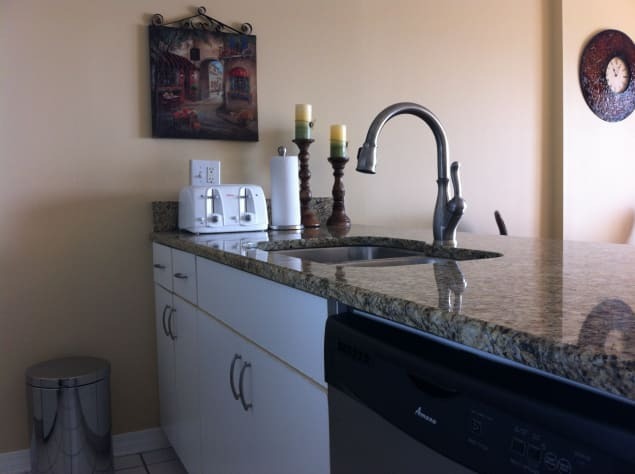 Our kitchen is fully stocked with all utensils you may need and also includes a refrigerator, microwave, coffee maker, toaster, oven and dishwasher. The unit also has a stacked washer dryer combo for your convenience! We use Brett - Robinson to professionally manage our condo - which in our opinion is the best of both worlds - You can email us with questions or price requests and we will ensure you have a resort like vacation stay. Royal Palms has its own beach and you can walk to the Pier early mornings like we do. Our young kids love the sand and lounge chairs are usually available through out the day. The Hang-Out and LuLu's are our favorite sea food places when we are in town. Gulf shores Zoo is also nearby and you will love feeding the goats!! Plenty of water parks and shops nearby for all your needs. We use a rental management company to manage our unit. Our rates are usually lower than the management company's advertised rates. As you are ready to book, we will request your credit card information - which includes your card number, expiration date, your home address and 3 / 4 digits behind your card. We will enter this information on our owner reservation system and complete the booking. You will promptly get a reciept for the amount you have paid. In all cases, we charge a small retainer and the balance is charged when you check in to collect the keys / parking pass. Thank you so much for allowing up to use your condo for our vacation stay. It was all we had hoped for and more. The view was awesome and the we all loved watching the dolphins play every day! We are planning a return trip for next summer and hope to stay at your condo again! Such a beautiful place and perfect for our family! Dear Rebecca and family - so happy that you all had a great time! Also glad that you were able to see the dolphins - we too have always seen dolphins everytime we have visited the condo. Thank you for your response as it helps us continue to put in efforts to maintain our condo for all our guests. We will be elated to help you plan for your next summer vacation! What a beautiful place. My Aunt and I always plan a birthday trip because we share the same birthday. I believe this is one of the best trips we have ever had. Loved the condo! Very clean, quite, and peaceful. The view was breathtaking! I loved the location of the condo and the fact it was not giant like some of the other condos on the beach. It seemed very isolated from lots of people, which I loved. It almost felt like we had the beach to ourselves!!!! I will definately be back, and I am hoping very soon. Yezad, you were very easy to work with and made the planning of this trip easy as can be!!! Thanks for everything! Thank you! We enjoyed having you and we want you to start the planning for your anniversary trip!! Where to start !!!! Thanks Yezad and Monaz for letting us stay here. We had a wonderful time! I love the view from the balcony, you could not ask for a better view. Seeing the dolphins while having my coffee in the morning was great. I love that is was the last condo before the state park because the beach was much less crowded there and I love having lots of space and not a lot of people around. One afternoon we were the only people on the beach in the area at the time and that was wonderful. I love that it is walking distance of the pier which we went to several times during our stay, we also seen sting rays and dolphins while at the pier and watching the people fishing was neat! The condo was great, 2 bathrooms was wonderful when you have you and children that you are trying to get ready to go out. Everything was clean and up to date. The kids of course loved the bunk beds, we had to flip a coin to see who was going to get to sleep on the top first! I also loved the easy access to the beach, all you had to do was get off the elevator and you were there. All the attractions around made it good for the kids also, I could just sit on the beach all day but it was fun for them to have something else to do. The kids also loved the pools and it was great to have those in case you had to get out of the water because of the weather. I can't say enough about what a great time we had and I hope we get to come back. Thanks again for letting us stay. Thank you so much for a wonderful review! We are equally pleased that you and your family enjoyed our condo and we hope you return every year to stay there! See you all soon!! Could not have been happier! The response they gave us was perfect, wanted to get in earlier than was booked and they responded immediately to make it happen. Condo was great and view was fantastic! Hi Pat and Fred, Thanks for the wonderful comments! We are indeed happy you could stay with us!! We hope to welcome you again soon! My husband and I really enjoyed are stay at Royal Palms 1207. 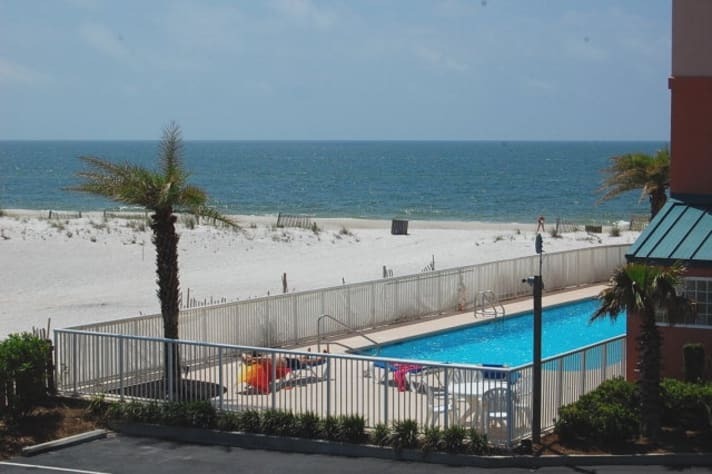 This is our favorite place to stay in Gulf Shores as it is next door to the State Park which makes this a quieter and less crowded area of the beach. 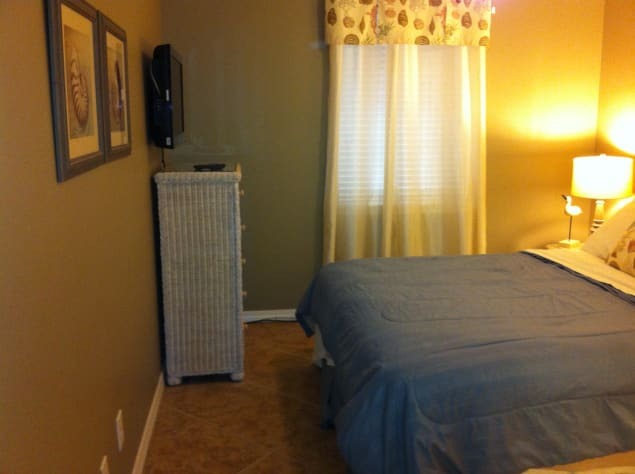 The unit was beautifully redone and had very comfortable furnishings and most of all was very clean. We would recommend this unit to others and I believe anyone who stays here will enjoy and will want to come back. Thank You for your wonderful comment! 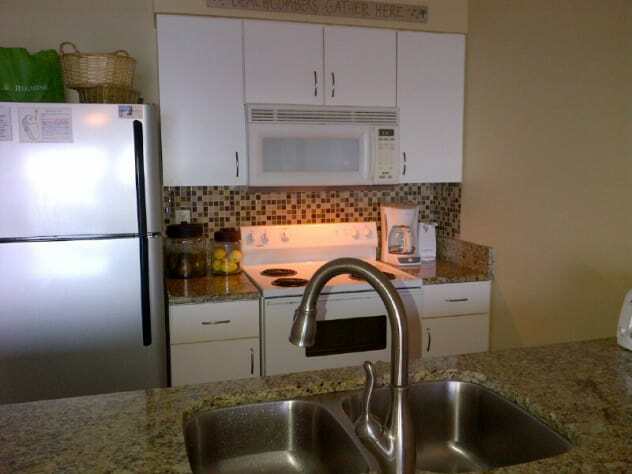 Our unit has been completely remodeled with the latest addition of granite counter-tops in kitchen and both bathrooms! We will hope you guys will return soon!! What can I say that I haven't already said before. We have stayed here at least 3 maybe 4 times and each has been wonderful. You guys are great to work with. This condo is always updated, clean, and perfect for us. This is where we plan to be every time we are in Gulf Shores. We plan our vacation around the dates this condo is open. I can't say enough about the view !!!!! My perfect morning is always having my coffee out on the balcony watching the dolphins. It takes my breath away every time I go out. We also had the privilege of watching a very vivid thunderstorm out over the ocean one night which is one of the most beautiful sights I have ever seen. Even though we were forced in by the rain it was still wonderful to see from that high up. I love that the condo is such a wonderful walk to the pier, we usually walk at least one time a day and sometimes more. Watching the fisherman on the pier is great and also watching some of the wildlife at the pier can be exciting and we don't have to get in the car we can just walk anytime we want to go. I also love that we are the last condo before the pier which makes the beach less crowded. There have been times when we were the only people out on the beach, which I prefer over the crowds of people. Our girls of course love the bunk beds, even though one is about to out grow the bunk bed we can move her to the couch. Being so close to the great places to eat is nice. The kids also love The Track. I also love that you can just go to the 2nd floor restrooms if you don't want to go all the way back up to the room. Easy access to the beach is great. You get off the elevator and you are pretty much on the beach! Two bathrooms is wonderful when we are trying to get all of us girls ready!!! Great updated kitchen if I wanted to cook, but I am on vacation so I let others do the cooking. We do very often go get something that we can bring back to the room and eat because we can enjoy that view while we are eating. Thank you guys so much for letting us stay! 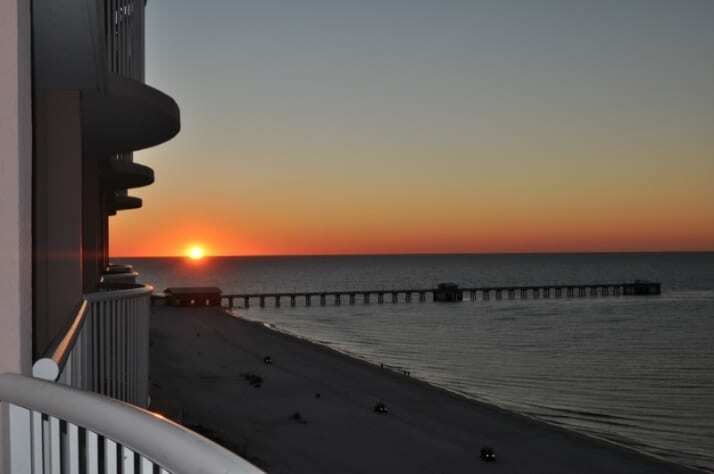 I always recommend this condo to anyone who is planning a trip to Gulf Shores and will continue to. Thank you for really spending the time to give a glowing review. It will forever be important for us!! Great week! Very nice condo. Amazing view from balcony. Enjoyed being in last condo on beach. Thanks Sylvia! Our location cannot be beat!! Thanks for staying with us and we cannot wait to welcome you again!! Thanks again so much guys for letting us stay here! This has been our second trip to your condo and we do not plan to ever stay anywhere else as long as we are visiting gulf shores. I can't begin to tell you what a wonderful time we had. The view from the balcony while having my coffee every morning is so wonderful and not a day went by when we were not seeing dolphins multiple times a day while we ate outside. The balcony was even great when we were forced indoors by a little rain and I was reading my book. The condo was just perfect for us with 2 full baths so we could get ready in a hurry to head out again. Your condo is clean and neat and just the perfect size for our family of 4, as well as being updated with what you need if you have to be indoors. I also can't say enough about the locations of your condo, with it being the last condo until the state park it kept us away from the masses of people and at times there were very few people on the beach it was very nice not to be stuck in the crowd and people and have room to breath. It is also a great walking distance to the pier, I don't remember how many times we just walked because it was so nice. When we did walk out on the pier we were able to see many of the wildlife around the area. We saw a shark (which was the biggest we have ever seen at the beach), also dolphins, and it was great to watch the fisherman catching the fish from the pier. It is worth the walk and the small fee to watch from the pier. The location of this condo is also great because you get off the elevator and you are basically on the beach, you can't ask for better beach access than that !!! The water was perfect and so clear we could see everything, and I will never forget how close the dolphins came to us while we were swimming out in the ocean it was a once in a lifetime experience and thrilled me so much. The weather was perfect with the exception of one evening of lightning and a little rain. The free wifi was also a great thing to have we could review restaurants in the area and get easy directions. There are so many places to chose from :) We love to order out and eat back at the condo just to enjoy the view. Although we did eat out one afternoon. If you guys have not gotten ice cream at the Hershey's ice cream place it is a must because it was to die for! I can't thank you enough for all your help and everything you did for us !!!!! I hope we get to come back many times in the future !!! Thank you all for staying with us again!! We indeed appreciate your continued trust in us and love for our condo! See you again soon! 3 adults 2 kids had a fantastic stay!!! Worried about 1 bedroom and having enough room but the 2 bathrooms made up for it. We had no problem with the space. Could have managed even 1 more adult comfortably and 2 would have been ok. The pools were nice but we are more about the beach and fishing pier. This building is the closest to the state park pier and that was awesome. We could drive there in 1 min.and walk there in 10 min. It didn't seem as crowded as other condos. Elevator was quick. Had lots of carts for bringing stuff to/from unit. Being on 12th floor gave us beautiful views. Everything was so comfy and clean and cozy. Wish we could stay longer!!! WiFi was awesome too. Had plenty of pots and pans and kitchen utensils. I did a ton of research before going with this condo. Hotels were overpriced and a friend told me to look up condos to rent on XXXX. I was running into the same thing with most of the condos I looked at. They wanted to much to rent it out. If it was a good price it was outdated. Of all the condos available to rent this one seemed to have it all and was AFFORDABLE!!! I sent the owner an email and Yezad responded extremely quick. Oh and the others I did contact I was lucky to even receive a response and if I did they were short in their responses. After talking to Yezad on the phone I booked this condo right away as any reservations I had were gone as Yezad was so friendly and professional. It was like I had known him for years! Ok so we arrive tired exhausted at each others throats ready to cry after traveling for 13 hours with hardly any sleep. Imagine 5 year old meltdowns. Check in was very easy and just a few minutes from condo. We are at the front door unlocking it and and and.......OMGOODNESS!! Immediate view of the water. Absolutely gorgeous!!! We looked at each other and could not quit smiling. Yay!! We are now rejuvenated 5 year olds. Very clean and I am a clean whack job. Updated throughout, nice furniture, granite countertops, every utensil cookware one might need. Stackable washer and dryer which was very useful. The bed was very comfortable and I had the best nights sleep I have had in a long time. Hearing the ocean was so nurturing. We enjoyed cooking and hearing the ocean. Royal Palms is the last condo on the beach so it's not crowded and very peaceful. My husband enjoyed walking to the pier every morning with his coffee. Lots of places to eat and shop. Stay away from Bubbas!!! Horrible service and the food was gross. We really enjoyed The Original Oyster House. Long wait but worth it. The peace we received from this condo and its locations was more than we expected. This condo was by far the best price and so nice on the inside. You really did feel like it was your home. We plan on returning next year and bringing our children as there is definitely plenty of space. Thank you so much for allowing us to stay in your condo!!! Hi Dawn - this is by far the best, most thoughful and flattering review we have ever had! Our sincere thanks to you for that! We strive to keep our condo updated with small details and we visit often to make sure it is exactly set for max comfort. Families like yours are exactly what we excel in and i hope to see you all again soon! Thanks once again for this fantastic review!! My wife and I made our first visit to Gulf Shores. I found this property on XXXX and contacted the owner. The owner (more about him later) responded quickly and helped me make my reservation. A last minute change brought us to Gulf Shores a day earlier - again the owner helped us add another day. The condo was great!! Very clean, nicely furnished with high-end touches...but the view is just incredible. We enjoyed the view every day morning and evening. Even watching the rain was great!! The location is just perfect...you might as well be on a private beach. Easy to get to restaurants, etc. Fast and easy to shopping including going to Orange Beach if you want. Now, while the condo was great, the owner is truly fabulous. Yezad was so responsive to emails, to texts, etc. He takes the extra step to make sure everything is just right. If you are considering an owner-owned rental but are unsure about dealing with the owner, do not think twice about this property. Yezad is just terrific!! We are already making plans to return!! Dear Dennis - words cannot express our gratitude for the awesome review! We cannot wait to have you back again... You will be always very welcome here..... Thanks!! 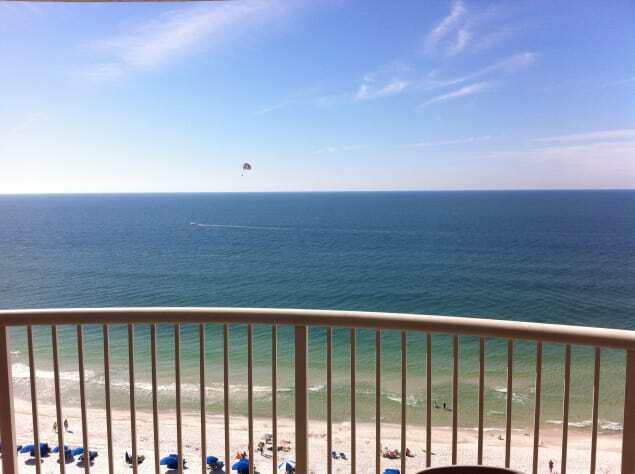 This condo is one of the best I've ever stayed at in Gulf Shores. Perfect location, right near everything... The building is right on the end, so it's beach area was not over crowded. I absolutely loved the magnificent view from the balcony. The condo is decorated beautifully, and I loved that it didn't have the obnoxious, bright beach decor that most beach condos have. Booking was extremely easy and the owners were very helpful with making arrangements and providing information. The master bed and pull out couch were both comfortable. Loved this condo, and cannot wait to return! Dear Carrie - thanks for the awesome review! We cannot wait to have you back!! Thanks again! Can't thank you enough for the great last minute accomodation. Easiest reservation I have ever madew. Awesome views from the 12th floor both to the east and to the west. Kitchen was furnished nicely with dishes and a slowcooker. The new granite countertops are beautiful. One suggestion would be larger coffee cups. We are heavy coffee drinkers but there was plenty of dishes and cookware. Second bathroom and washer/dryer were a plus. Complex had two pools, one inside heated, and a hot tub. 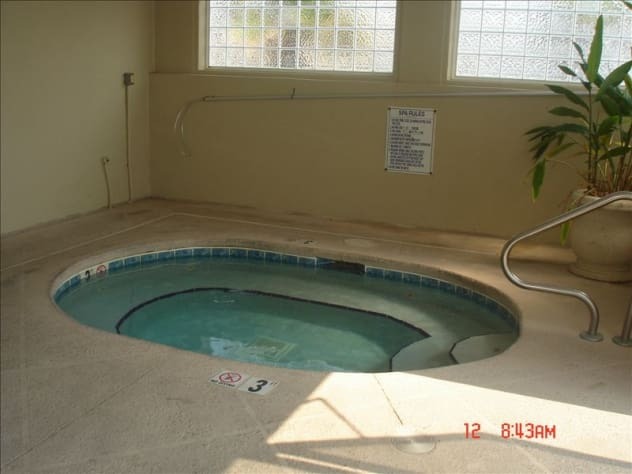 Hot tub is well heated and the whole complex very clean. Location Location Location. Parking never overcrowed and easy to get to. Grocery stores and resturarants close by. 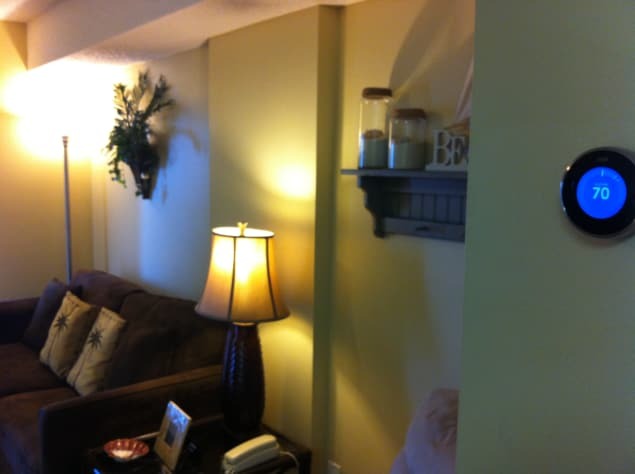 Great condo and owners extremely nice to work with. 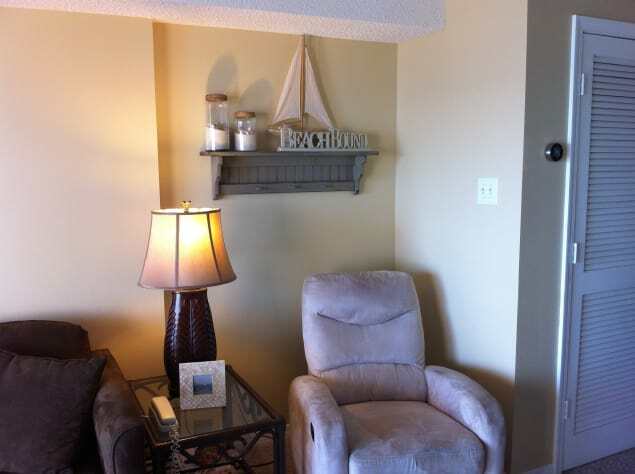 This condo is great for a couple or small family. 10 stars. Will be recommending to family and friends. Thank you! We equally enjoyed the ease of this reservation. Thanks again for the generous review and we hope to see you soon. Larger coffee cups duly noted and will be added! Another wonderful vacation at this location. The view !!! We just can't get enough of this view. Watching the dolphins from here is amazing. We love that we can get our food from restaurants and bring it to the balcony and have dinner there if we choose. We didn't get to go on the pier this time because Nate had just come through, but I still love this side of the beach because the crowd is on the other side. I love easy beach access !!! The beach was so nice even at night we had a blast crab hunting. Two full baths and a washer and dryer is perfect. I can have our laundry going while we are on the beach and then I don't have so much to do when we get home. This is our home away from home and I hope we get back very soon !!! We enjoyed our weeks vacation at this condo. The views were beautiful from the 12th floor balcony and the condo was well updated, nice and clean. The unit is located next to the State Park property which gives a feeling of privacy and a nice walk to the the Peir along the beach. We truly had a great time and I would recommend this property to anyone looking to relax and refresh. Thank you for the wonderful review. Hope you can turn your first visit to many more years to come!! 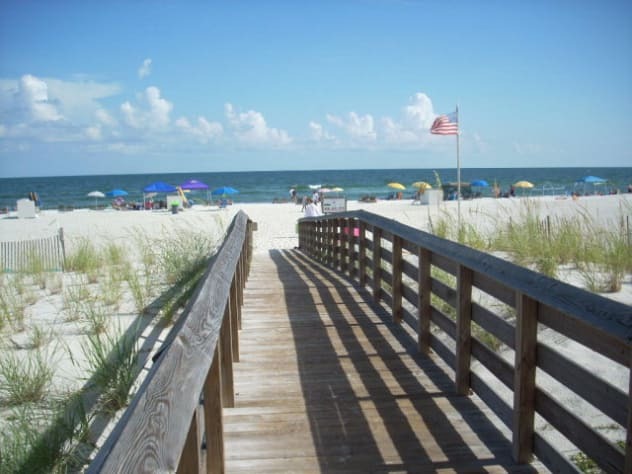 Our family had planned a week in Gulf Shores after a long and hectic spring and summer. We were looking for something right on the beach, close to restaurants and activities but somewhat secluded and calm and not hemmed in by a lot of other buildings. 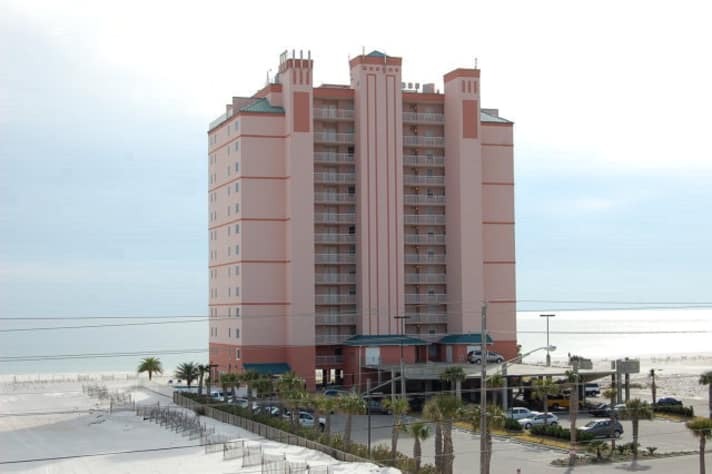 Royal Palms did not disappoint in its location as the last building beachside before a state park w/pier! The facilities were extremely well kept and the views from our balcony at #1207 were spectacular! The contact with the owner was seamless, helpful, friendly and generous whether by email or phone. The condo was well appointed with all the amenities one would desire. We couldn't have asked for a better experience with them. We would return in a heartbeat because of the location (immediate beach access, beautiful views, proximity to all necessities, impeccable upkeep, peaceful spaces) and due to our superb experience with the owner! The memories our kids made prompted them to rate this one of their top vacations ever! Thank you so much Mr. Blair and family! We love your review and cannot wait to have you all back!! My wife and I were married the day before we arrived at the condo, and we had a fantastic time. The condo itself was a decent size, capable of accommodating a four-person family (with small children). The condo was in great shape, however, we did not spend much time in the condo itself because we were at the beach and going other places. The owners were really great, and the communication and fairness they impart were commendable. I was very pleased to do business with them, and I recommend this condo to anyone looking for a great time and a great price. Congratulations on your wedding and may you have a blessed life! Thanks for staying with us and we appreciate the good review! We hope you can return to make more memories!! Lots of warm regards! This year marks our third time to stay in this condo and it is the perfect getaway for a couple. 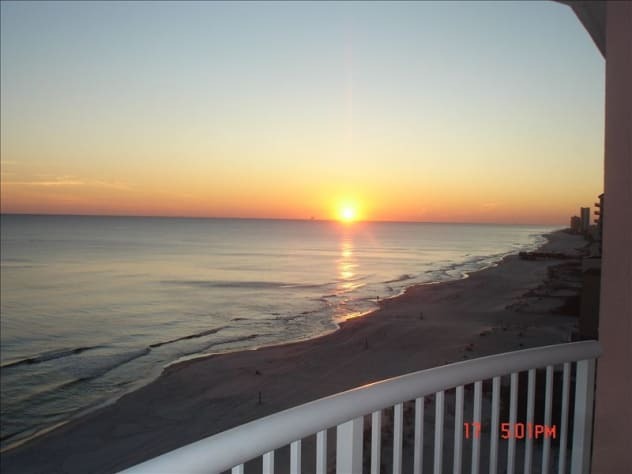 We have fallen in love with the Gulf Shores area due in part to the location and the peacefulness of the Royal Palms. 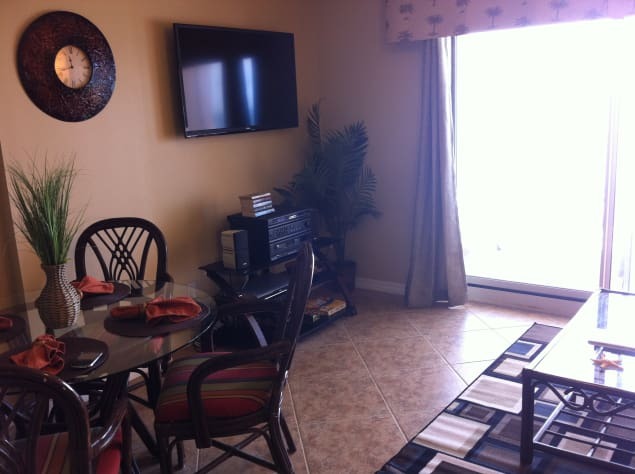 The condo is very well maintained, is secluded, is convenient, and the views from the balcony are amazing. We plan to return annually and have recommended this location to our friends and family. Truly a slice of heaven! My family of four had the BEST time at Royal Palms. 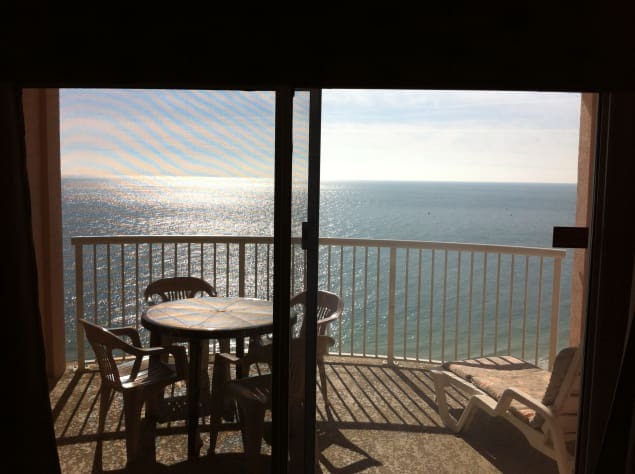 The view was amazing--looking out the balcony doors you see only the Gulf! This part of the beach was by far the most peaceful, least crowded space on GS. We saw dolphins from the balcony, used flashlights at night to chase sand crabs & we loved swimming at the beach and in both pools. The kids LOVED their bunks & we loved them having their own bathroom--I'd take a 1 bed/bunks w/2 bath condo any day (over a 2 bed/1 bath like many other buildings have for more $) The building and grounds are very secure and well kept. The owners are very nice and accomodating & management company convenient for key pick up/drop off. Having Wifi in the condo was a wonderful convenience too. Balcony was huge & the view gorgeous. This was our first condo rental & first big trip with both our kids, age 6 & 10 and it was fabulous. We'll never stay in a hotel again (except on our way to/from Royal Palms I hope!) Husband says "Everything I was expecting AND MORE!!" We could not have asked for a better review!! Thank you Marta and family! Maybe we will take your idea and chase sand crabs next time!! We will be eagerly waiting for you to stay again! We stayed at this condo for spring break and loved it. Nice layout, clean, updated, and comfortable for our family of 5. The view from the balcony is breathtaking! The kids loved the beach, but we ended up spending a lot of time in the indoor pool due to the weather. I think they liked the pool more! Also, the owner was very helpful and responsive to emails. The only complaint we had was there were no grilling area on the property. Hi Amy and family - so glad you could make memories at our condo. Thank you for the good review. I am sorry about the lack of grilling area - this is due to a home owners decision. Just for future information, Gulf Shores state park - which actually borders our condo building has a great grilling area and is walkable distance. Hope to see you again!! I had wanted to have a vacation with my grandson for years we had never had one together. This turned out to be the perfect place for us both!! The condo was perfect we both loved the view from the balcony, having two big screen TV's and bathrooms. When we couldn't go to the beach the indoor pool and sauna was a lifesaver. I hope to make this a yearly adventure. I've already told everyone this is the perfect place to go and if they go I want to go with them too!!!!! Thanks Shirley - we hope you continue to visit Gulf Shores and create more memories. We are equally elated that you enjoyed your stay and we will be on standby to serve you again!! This was the first time we have ever taken a Spring Break trip. I was very hesitant on going to the beach after hearing horror stories of peoples trips to Panama City Beach at Spring Break time. 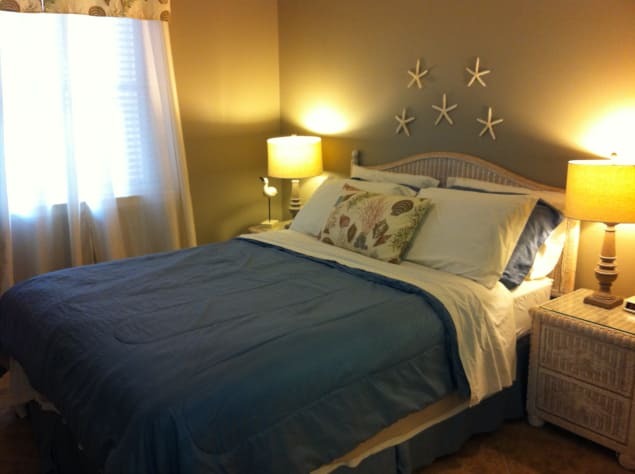 I chose this condo after reading all of the great reviews it had and it was next to the State Fishing Pier. The owners were very quick to answer my questions and very nice and we would definately stay in this condo again if we return to Gulf Shores. Very clean and very nice decor throughout. I am afraid of heights and with this condo being on the 12th floor I was afraid at first to go onto the balcony but I quickly faced my fear and i spent alot of time reading and enjoying listening to the ocean. The beach was never busy even with it being Spring Break. I noticed almost everyone were families and none of the college parties went on in this area and it was very peaceful. The beach is very clean and the swimming pools and hot tub were so nice to just relax and were never crowded. We spent our 20th wedding anniversary on this trip and could not have asked for a better place to spend such a special day! Would recommend this condo and I want to thank the owners for allowing us to stay at their beautiful condo!! This was our first trip to the beach and it was just awesome!! Location of this property is wonderful and we loved the beautiful view from the balcony. 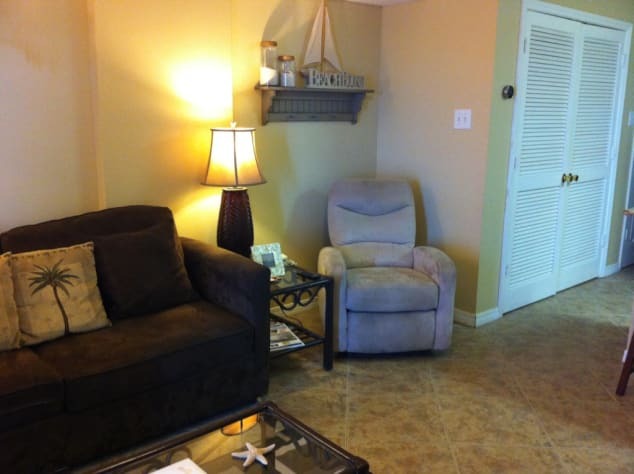 Clean and well maintained condo. 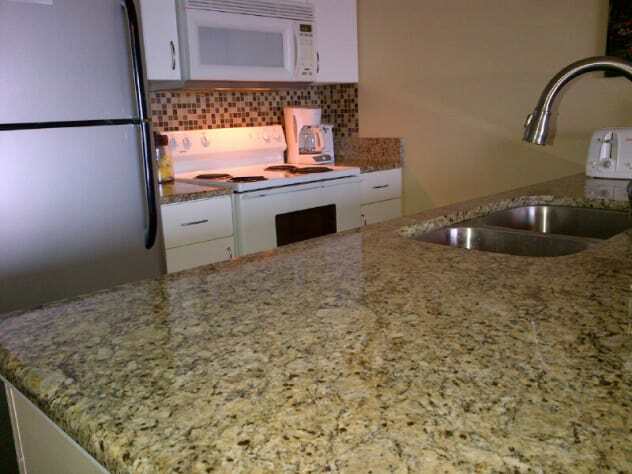 Was impressed with the well equipped kitchen and loved the Granite counter tops. Would definately stay here again.